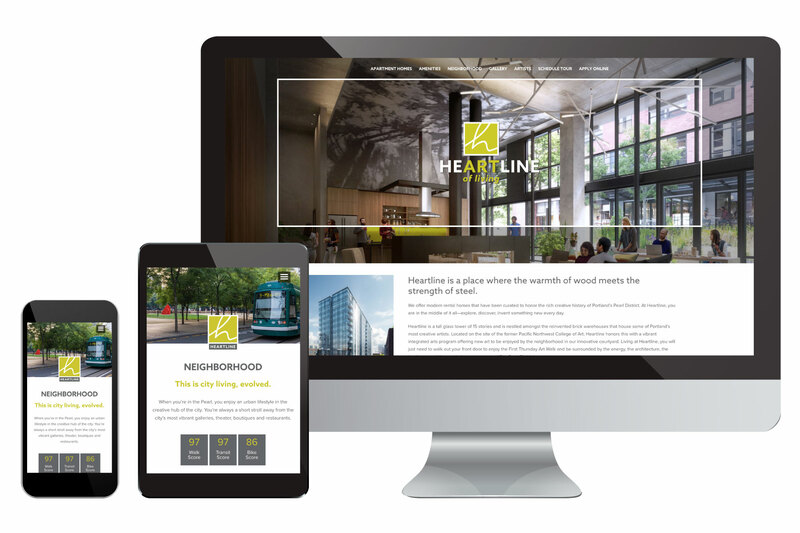 Heartline is a new luxury apartment building in the heart of Portland’s Pearl District. We were excited to employ all of our design and development skills on this project. Aaron, worked in conjunction with Fish Marketing to name the building. We then designed the logo, interior and exterior building signage, business collateral, and designed and developed the website. The logo design involved mood boards, multiple concepts for initial review, and several draft revisions. The brand identity was designed to work across all media. The architect stipulated the use of the citronella color, which we used as an accent against a deep gray to work with the concrete, glass and steel elements of the building. We incorporated the tagline “Art of Living” into the logo. Working closely with the printers and signage producers, we ensured high-quality design and web deliverables that underscore the quality and luxury of the building.